Take the 4 therapeutic keys of Homer’s Odyssey and return to the Ithaca of your heart. Visit the land you are familiar with from your school books and be a part of its myth. Return home with Odysseus in an innovative workshop in Greece. With Homer’s hero as your guide discover the challenges of your own life and map the way back to your spiritual homeland. The Cyclops, the land of oblivion, the mesmerizing sorceress, the visit to the underworld, the contradicting forces, the opponents and the helpers of Odysseus . Discover their presence in the story of your life. Evaluate the price paid. Remembering and taking distance. “ I am nobody anymore. I am Odysseus the king of Ithaca and I want to go home!” Time is right to face and purify the opponents, contradicting forces. Triumphal reinstatement in the inner kingdom. The reunion with your Higher Self and the Source. Where: the workshop location is Noosfera Center, a purposely-built complex of wooden cottages created for self awareness and psychology seminars, yoga and tai chi workshops, alternative holidays, educational and recreational events focused on spiritual development and consciousness expansion. Cost 740€ Included: The 4-day experiential workshop , matterials, double occupancy accomodation with private bathroom and mini fridge , free wi-fi. Amenities: slipers, shampoo, shower gel, bath cup, hair dryer. Full board ( breakfast, lunch and dinner) with fresh, homemade delicious food enriched with organic vegetables and eggs from Noosfera’s garden and chickens. Transfer from/to the nearest train station (Kiato) to Noosfera. Homer’s Odyssey is interpreted on multiple reading levels. And it contains many secrets. 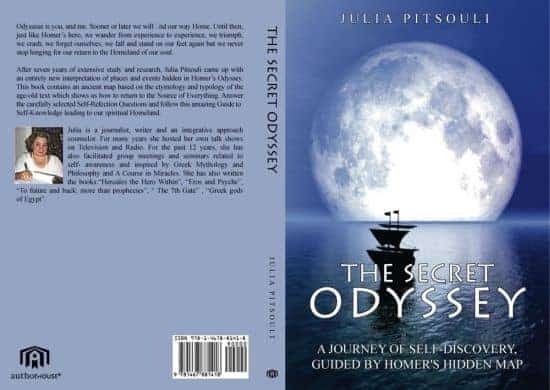 After seven years of extensive study and research, Julia Pitsouli came up with an entirely new interpretation of the Odyssey, deciphering the etymology of names and the typology of places and events.